"Like Cracker Jack for adults." 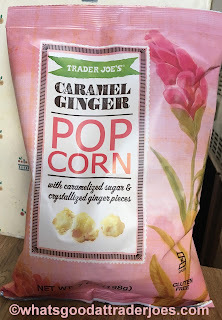 Those were the first words out of Sandy's mouth after her initial sampling of Trader Joe's Caramel Ginger Popcorn. And it is kinda the easy comparison - the known American classic that pretty much anyone has at least a vague idea of what it is. Cheap popcorn, heavily coated in corn syrupy caramel with surprisingly few peanuts and a dumb sticker that sticks less than all the kernels leftover in your teeth. I mean, who really enjoys Cracker Jack? 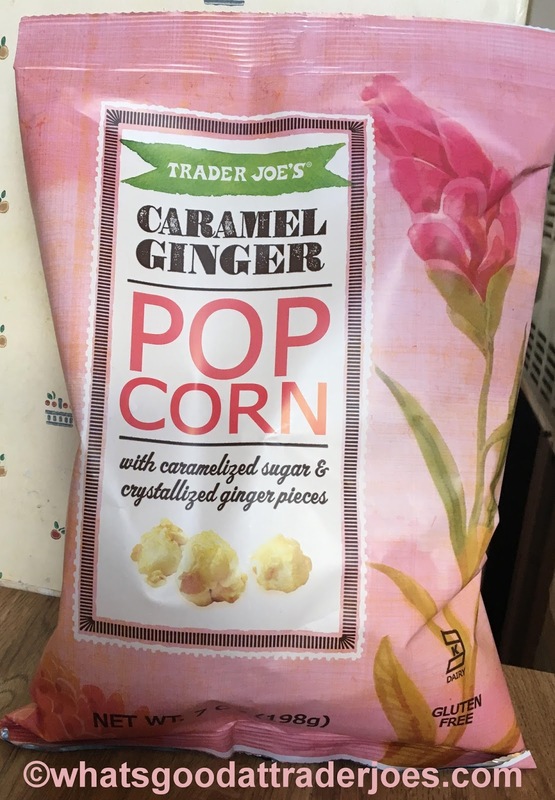 All that being said, this Caramel Ginger Popcorn is pretty tasty. With a caveat or two, yes, but still....much better than Cracker Jack. First off, it's pretty decent popcorn - surprisingly fresh tasting for a bagged product. And the coating of caramelized sugar, while a little uneven and thicker at times, is by-in-large thinner and adds a more-crispy-than-crunchy element. Most bites are more sugary than anything else, but not too over the top. Of course, there's the ginger though...the further you dig into the bag, the more it's there. Other than an occasional hint here and there, there's not much of it about at first. Midway thru, it's almost an every morsel occurrence. But by the bottom, if you don't like ginger - pick carefully. That's where all the crystallized ginger nuggets reside, bursting with ginger heat ready to singe the tastebuds. It's not entirely unpleasant if you like such things, but if you're ginger adverse, steer away. This sounds fantastic to me! I'm a big fan of the kettle corn at TJs which has a similar thin crisp coating. To get more even ginger open the bag upside down- a trick i learned long ago for raisin bran. These aren't bad at all. My only wish is more of a ginger bunch. But nothing wrong with caramel corn. Yum.